(1970) "When You're Hot, You're Hot"
"When You're Hot, You're Hot" is a 1971 crossover single written and recorded by Jerry Reed. The song was his most successful on the country chart, peaking at number one for five weeks. 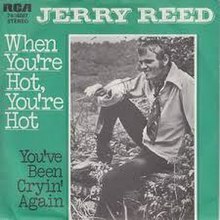 "When You're Hot, You're Hot" was also Jerry Reed's second song to cross over to the Top 40, peaking at number nine. It also appeared in the Australian and New Zealand charts. "When You're Hot, You're Hot" was certified gold for sales of one million units by the Recording Industry Association of America. The refrain of the song indicates: "When you're hot, you're hot/ "When you're not, You're not". The song describes an illegal game of craps being played in a back alley. The singer is having a streak of good luck against his two friends, winning several games in a row. In the second verse, a police officer discovers the game, arrests the participants and "take(s) all that money for evidence." Undaunted, the singer believes his good luck streak will continue and tells the cop "when you're hot, you're hot." The third verse describes the trio in court to face the punishment, and to the singer's delight, he finds out that the judge presiding over the case is one of his old fishing buddies—whom, as it turns out, he owes money. When the singer attempts to bribe the judge by offering to pay back the money in exchange for a lighter sentence, the judge grins and does the opposite: gives the other two small fines, but sentences the singer to 90 days in jail with the response "when you're hot, you're hot!" The song ends with the singer going into a tirade against the judge, telling him that if he weren't in his black robe, he'd have been physically attacked, and that someone would have to "collect my welfare, pay for my Cadillac." The judge immediately declares the singer to be in contempt of court. The chorus lyrics of this song appear at the very end of an episode of The New Scooby-Doo Movies, sung by Scooby and Shaggy as they attend a performance by Jerry Reed, who guest starred in the episode. The lyrics, "When you're hot, you're hot", and its opposite, "When you're not, you're not", have been used in American pop culture for many years following the popularity of the song. It was especially a catchphrase on The Flip Wilson Show. ^ Whitburn, Joel (2004). The Billboard Book Of Top 40 Country Hits: 1944-2006, Second edition. Record Research. p. 283. ^ Whitburn, Joel (2004). The Billboard Book of Top 40 Hits: Eighth Edition. Record Research. p. 523. ^ "Jerry Reed on Scooby Doo". YouTube. 2006-08-11. Retrieved 2012-03-14. ^ a b c "Jerry Reed". AllMusic. Retrieved 2012-03-14. ^ "Item Display - RPM - Library and Archives Canada". Collectionscanada.gc.ca. Retrieved 2012-03-14. ^ "Go-Set Australian charts - 7 August 1971". Poparchives.com.au. 1971-08-07. Retrieved 2012-03-14. This page was last edited on 21 November 2018, at 02:28 (UTC).